Where to skydive in Philadelphia: the closest skydiving center to Philly. Skydive Cross Keys is located 15 miles south of Philly and is the absolute closest skydiving center to Philadelphia. We are only 20 minutes away from Walt Whitman Bridge, and only 30 minutes away from downtown Philly. A taxi or Uber ride from downtown Philadelphia costs about $25 - $45 depending on the time of day. Catching a return ride from our location is easy too. Here are the turn by turn directions to our location from downtown Philadelphia. Address: 300 Dahlia Ave, Williamstown NJ 08094. Turn right onto Dahlia Ave. Our skydiving center is at the very end of Dahlia Ave! 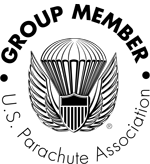 We operate multiple aircraft every day, so your group can skydive together! We are beyond excited to give you the most amazing experience possible!